Rummaging around in my chest freezer on Friday, I found a very small piece of bone-in pork shoulder, cut from a larger piece bought around Memorial Day. It was just the right size to fit on my Mini Green Egg: a low-and-slow cook for just a few, rather than a crowd. And while I was experimenting (this would be my first low-and-slow cook on the Mini), why not ditch the usual barbecue rub too? Oh, there’s nothing wrong with the usual sort of flavors applied to pulled pork: brown sugar, salt, black pepper, dry mustard, paprika or smoked chilis, hot stuff like cayenne, maybe some cinnamon, cumin, garlic, onion, or even chocolate or coffee in the more exotic variations. But I wasn’t in the mood for the whole coleslaw/soft buns/baked beans scene today, so I decided to head off in a different seasoning direction. Taking inspiration from the fennel and garlic flavors of Italian porchetta, I mixed garlic powder, crushed whole fennel seeds, dried Italian seasoning herb blend, orange-zest sea salt, black pepper, and enough olive oil to make a paste and coated the entire piece of pork. After I stabilized the Mini at 250, the rubbed pork went onto the raised grid, with a crimped sheet of aluminum foil beneath the grill surface to catch the drips. I should have removed the Mini’s dome thermometer, as it poked into the pork when I closed the lid, but I was too lazy to find a wrench (and besides, the temperature was perfect before I put the roast on, so I wasn’t really worried about it touching the pork). At the four-hour mark, the pork’s internal temperature was hovering around 175 degrees, so I added a few more pieces of lump charcoal and let it go for another half-hour until it reached 200 degrees. It smelled so good, I could hardly stand to let it rest before slicing into it. 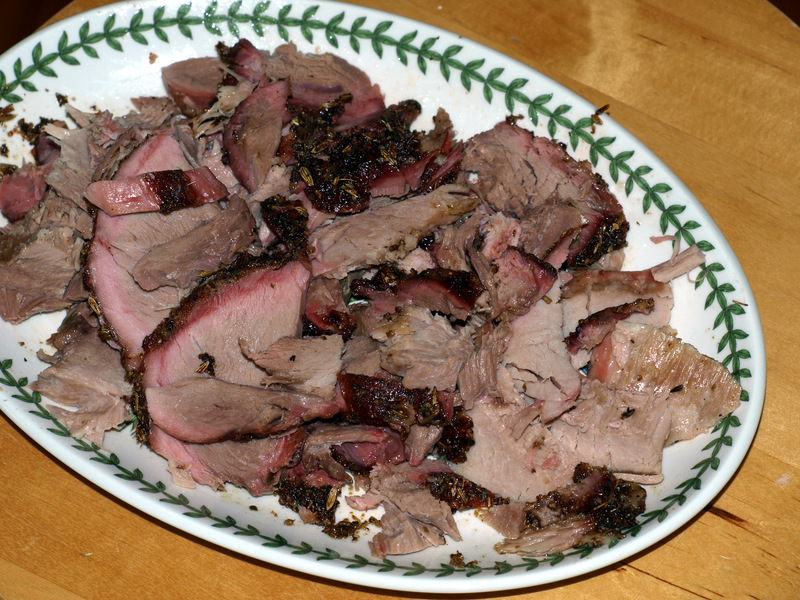 In another departure from pulled pork tradition, I did make rough slices rather than pull it into ragged shreds. (Somehow, it seemed more elegant and Italian to slice rather than shred.) Regardless of the cut, the finished pork was fragrant with fennel, sage, and rosemary, and it had developed a nice bark despite the seasoning blend’s conspicuous lack of sugar. It needed no sauce but hunger, and it paired beautifully with rosemary roasted potatoes and sauteed arugula. Blend all ingredients together in a small bowl. 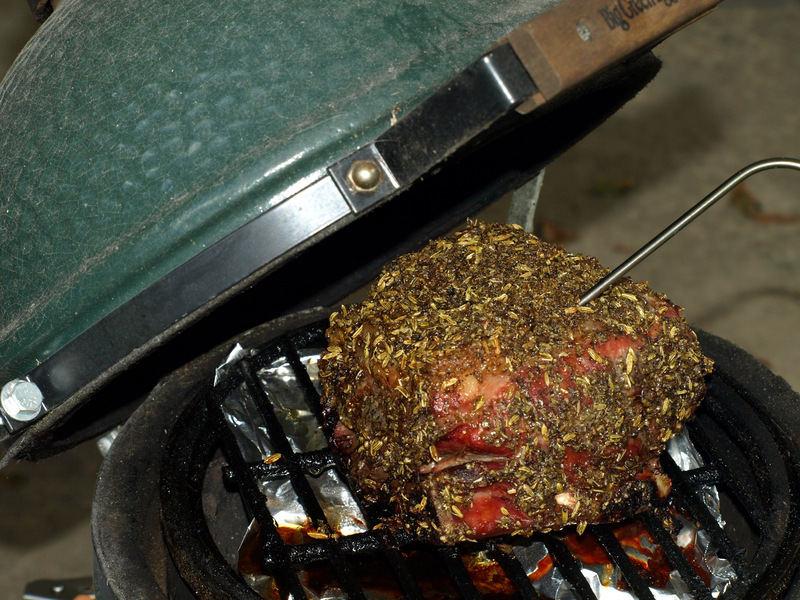 Rub seasoning paste liberally on the outside of a bone-in pork shoulder. Amount listed will cover a small cut; double or triple as needed to cover a larger pork shoulder. I have always wondered if you could actually smoke in a mini. Now I know! Yes, indeed, you can smoke in a Mini. You can’t get more than about 3-4 hours on a full firebox, so no overnights unless you’re prepared to babysit it. Ha.